…a vaulted chamber lit by a single bulb. Someone knocked a bowl off the table. The crash echoed from the ceiling and whispered away down the corridors. I broke another on purpose. “Take what?” they wanted to know. ● The sign labeled “SiGN” is up against the bowling pin. The lower case ” i ” looks like the white part of the bowling pin (the black stripes separate the dot from the stem) making another ” i “. [Credit: Aria | Credit: White Raven] In outlines ” ii ” is the number 2. [Credit: Test / Saints This Way | Credit: White Raven] The remaining letter “SGN” is a reference to the sign function which is abbreviated “sgn” or on calculators as “SN” or “SGN”. So “SiGN” contains both the names “sign” and “sgn”. The sgn function in simple form is written as “sgn(x)” in a function, and the archetypical representation of the function is x=sgn(x).|x| As a person who betters understands math put it, “sgn is a mathematical representation of absolute value “x”.” The upper case “SGN” suggests that this part of the puzzle stays on the arrow sign while the lesser ” i ” is paired with the bowling pin so the solution reads ” xii ” instead of the alternate possible order ” ixi “. In lower case Roman numerals ” xii ” is the number 12, indicating door 12. The single bulb is the Sun at noon. I do wonder whether SiGN is meant to make us think of SYMBOL = CYMBAL — the parasol the clown is carrying looks quite a bit like a cymbal, and he has a “high hat” (HI HAT) to reinforce the connection. The lowercase “i” in SiGN could be to help us make the connection since it kind of looks like the handle of the parasol/cymbal with its round end (upside-down). And the cymbal (if it is a cymbal) has a pointy thing on top that points at 12. Is this crazy? It’s crazy, isn’t it. And it doesn’t tell you why you shouldn’t just follow the damn SiGN in the first place. Here’s a silly one that just occurred to me. Probably far-fetched but kind of fun. If the clown is Punch, perhaps we should think of types of punches, such as “the old one-two” (12!) or “the one-two punch,” an idiom referring to two punches delivered in quick succession — some sources indicate specifically “a left-hand jab (the “one” in 12) followed by a right cross (the “two” in 12). Are the clown’s hands in fists? The right hand certainly is. Perhaps Toothless above the unnumbered door is a victim of said punch combination. I believe the reference to voting could be alluding to a jury of 12 people. *edit* looks like Brent beat me to it. Here’s one that I didn’t notice before because it’s a detail I haven’t paid much attention to in the past. It also might be a game changer in terms of consistancy with repeating objects. The umbrella’s tip is not visible, but its handle is a clear L. Not only is L the 12th letter of the alphabet, but the tip of the L is pointing to the picture, in which that umbrella is pointing tip first to 12. The stethoscope could be interpreted as “listen to this image” since the terminal is pointing towards the clown’s rump (let’s also remember that there is a hidden 12, possibly, in the picture of the clown). So why is this a game changer? In Room 10 the unbrella points to the correct door, and in 42, of the three doors against the far wall, the umbrella is the first item in the stand (corresponding to the first door on that wall). Wait..that’s all the umbrellas in Maze except for the one in the Prologue. So basically all the umbrellas are good, if interpreted correctly? Lol- I can’t stop seeing Darth Vader in the ceiling above 29!!! Oh, I’m just going to put this down. Explanation for SiGN: on the rightmost door, which is unnumbered, we have an S, an eye, and a gap-toothed GRIN. Yeah, I know, it doesn’t really explain the lowercase “i” although there is sort of a pronounced vertical line on the face that leads up to the pupil of the eye, which is just visible. Anyway, the arrow sign on the floor points to the left. If “SiGN” refers to the rightmost door, then you take the door on its left — the door to Room 12. This is a very violent room. There’s the “bang” (exclamation point) on the sign, there’s “Punch,” and there’s the “strike” of the bowling metaphor. Maybe someone was killed here. With the candlestick, perhaps? Maybe it was Mrs White — her game piece is hiding on top of the barber pole. 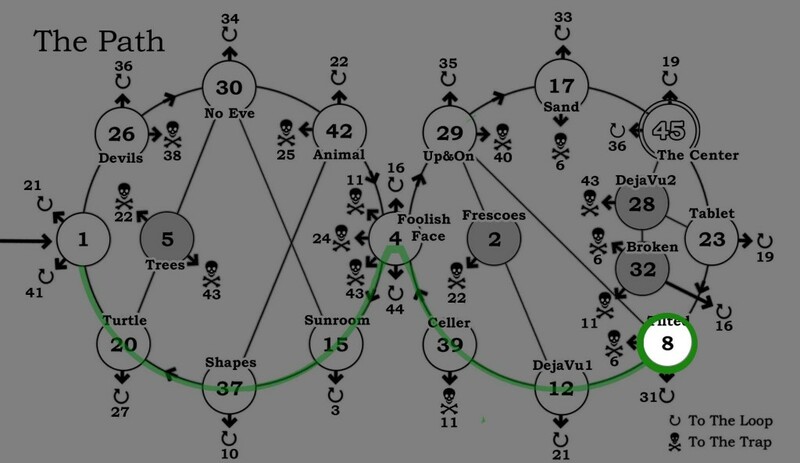 Clue has 6 possible weapons and 6 possible suspects… 6 + 6 = 12. 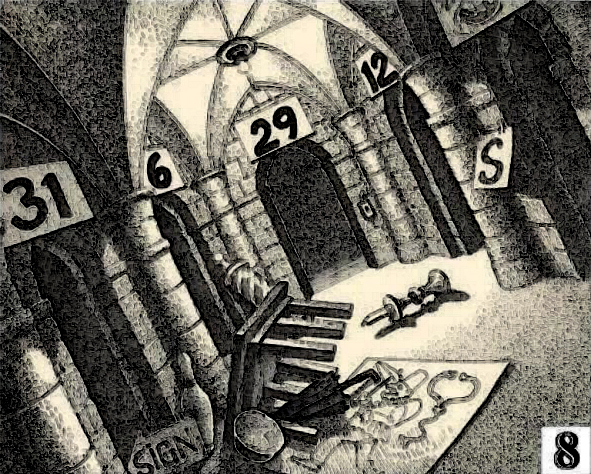 If you add the 9 possible murder rooms you get 21… reversed, like the shadow of the candlestick, to get 12.